female black widow spider. Image: Wikipedia. Black widow spiders are notorious for their painful bites and lethal venom. The venom is potent enough to let these spiders and their close relatives prey upon small reptiles and mammals that other arachnids wouldn't ever eat. This raises the question: just what makes the widow spiders so unusually toxic? And how did they become so toxic to begin with? Dr. Jessica Garb of the University of Massachusetts, Lowell, along with a team of collaborators in the US and the UK, has been attacking these questions by studying the spider's genetics, protein expression, and venom content, searching for clues about just how the widow spider's venom evolved to be so potent. 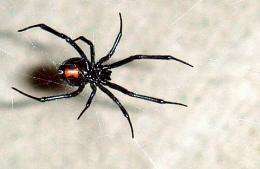 The most potent neurotoxins present in black widow venom are called latrotoxins, which takes its name from the group of widow spiders known as Latrodectus. The most toxic of these latrotoxins is alpha-latrotoxin, a devastatingly debilitating chemical that hijacks the body's own internal communications, the electrical and chemical signaling of the nervous system. "If you got bitten by a black widow," says Garb, "alpha-latrotoxin would travel to the pre-synaptic regions of your neurons: this is the juncture right between the synapse of one neuron and your muscle cells or another neuron, and it inserts itself into the membrane. This causes all of the neuron's vesicles to dump out their neurotransmitters. And that's really what's painful." In other words, alpha-latrotoxin causes nerve cells to release all of their chemical signals at once, overwhelming the nervous system, and causing immense pain. In fact, alpha-latrotoxin has been studied for a long time by neuroscientists, not spider biologists, as a tool to help them understand how neurons function. And yet, until recently, the latrotoxins were thought to be a very small group of proteins. Garb's research has shown that latrotoxins are actually a much larger group than expected, and can even be found in the common house spider. But don't worry—the common house spider, though closely related to the black widow, is not generally considered toxic to humans. The difference in venom potency between the widow spiders and the house spider may largely be a matter of the production of toxins, but not the genetic ability to do so. "It's not just about the numbers of these latrotoxins, but their relative expression," Garb says. Even though the genes for multiple latrotoxins exist in house spiders, they appear to be produced at much lower levels in their venom compared to black widows. Genetics, of course, still has a role to play in the evolution of spider venom. "The house spider genome is a great resource for us, because we can now get the full landscape of what's in the genome of one of these spiders," explains Garb. By studying more than one species, the researchers could compare latrotoxin genes among closely-related species that vary in venom functionality and toxicity. The researchers found that the latrotoxin genes among spiders, while clearly related, are highly divergent. "There has been a lot of lineage-specific evolution of this latrotoxin family, and the set of latrotoxins in house spider venom appears to be quite distinct from those in black widow venoms" says Garb. In other words, instead of having latrotoxin genes that have evolved slowly, gradually accumulating differences, the team believes that these genes have been duplicating and changing over a relatively short time period, contributing to the potency of black widow venom. The fast appearance of multiple latrotoxins probably allowed the spiders to pursue a variety of prey items, including the small mammals and reptiles that widow spiders might not otherwise be able to eat. It's even possible that the widow spider's web changed along with the venom, becoming stronger to keep a hold on these larger prey. In addition to discovering the diversity of latrotoxins within many species of widow spiders, examining the venom's composition revealed another trick up the widows' sleeves. After milking venom from the black widow spiders, Garb and her colleagues found that widow venom is actually made of many different types of toxins. And some of the contents of the venom were not just neurotoxins, but rather chemicals that likely help the toxins reach their targets within the body. So while we may have a good understanding of alpha-latrotoxin, scientists are only just beginning to appreciate the complexity and evolution of spider venom. Garb presented her team's research findings at the 2015 annual conference of the Society of Integrative and Comparative Biology in West Palm Beach, Florida. Which is the world's deadliest spider, really? Are brown widows displacing black widow spiders around southern California homes?